One of three concepts, the free-flying lunar lander became the most important simulator for the Moon missions. 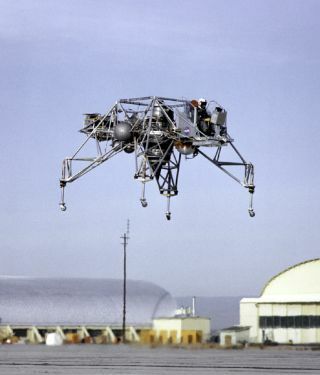 In this historical photo from the U.S. space agency taken in 1964, the Lunar Landing Research Vehicle (LLRV) Number 1 flies at the South Base of Edwards Air Force Base. When Apollo planning was underway in 1960, NASA was looking for a simulator to profile the descent to the moon's surface. Three concepts emerged: an electronic simulator, a tethered device, and the ambitious Dryden contribution, a free-flying vehicle. All three became serious projects, but eventually the NASA Flight Research Center's (FRC) Landing Research Vehicle became the most important.